NelsonHall’s Evaluation & Assessment Tool (NEAT) provides strategic talent leaders with a comprehensive, objective toolkit as they evaluate potential outsourcing vendors and talent solutions partners. The NEAT tool evaluates vendors based on a combination of feedback from vendor clients, analyst assessments, and measurements around the ability to deliver immediate and future benefit. The report, available to you complimentarily by filling out the form, also provides a pragmatic look at WilsonHCG's ability to take clients on an "innovation journey" over the lifetime of each partnership. At WilsonHCG, we improve organizations’ efforts to attract, engage and retain today's leading professionals through our integrated, highly configurable model and relationship-driven approach partnership. For you, this optimizes the candidate experience, creates talent acquisition decisions fully informed by analytics, and drives greater revenue. 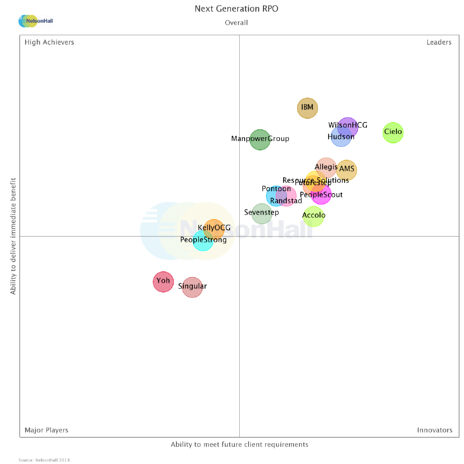 Fill out the form for complimentary access to NelsonHall's full report, and to uncover why WilsonHCG was identified as a Next Generation, global RPO Leader.